This past week I read Eat Pray Love. Since the movie just came out, I wanted to see what all the hype was about. I won’t give you a full book report, but I will say the premise of the book is fascinating… in a narcissistic way. Who wouldn’t want to take a year off of life and “find yourself” in exotic places throughout the world? Author Elizabeth Gilbert decided to spend four months each in Italy, India, and Indonesia. Having been to a few places around the world myself, I’m fairly certain I would NOT have chosen India…. perhaps Indonesia… and probably Italy. Her time in Italy was interesting because it comprised the Eat section of her book. She literally ate the entire time she was there. We all know the Italians make some good food. Imagine spending four months immersed in Italy with your main focus being to learn Italian and to eat your way around Rome. I think I could handle that. In a large skillet, brown sausage over medium heat; drain and set aside. In a large saucepan over medium heat, combine tomato sauce, diced tomatoes, bay leaves, Italian seasoning, garlic powder, basil, oregano, salt, pepper and Italian sausage; mix well. Simmer over medium-low heat for at least one hour; it is best if simmered all day. Mix sauce with hot pasta; serve. Technically you are supposed to let the seasonings and meat sit for 24 hours, but I didn’t think that far ahead so they just got mixed in before I browned the meat. The reviews that I read said that the Italian sausage is the secret ingredient for the sauce so perhaps it would be better to actually use real Italian sausage or make homemade ahead of time properly. The recipe says that it’s best when the sauce can simmer all day. Mine simmered for about 2 hours. This was easy enough to do as it’s really just throwing everything in a pot. I bet you could even do this in a crock pot and let cook all day. I didn’t actually have the tomato sauce. I did have a 28oz and 14oz can of chopped tomatoes. I used the entire 28oz can and then drained and pureed the 14oz can in the food processor. Worked great! I found I had to add some spices after tasting the sauce after it had been simmering for a while. I also added 1/2 onion, chopped, and 2 cloves of garlic, minced. I did have to add a little water to mine as it cooked down. I also kept the pot covered. I liked the sauce. It definitely was tastier than the stuff out of a jar. Add some garlic bread to this and it was DELICIOUS! Some pre-planning is required for the sauce to simmer for an appropriate amount of time. I don’t know how authentically Italian my spaghetti turned out, but for this midwestern American, I think it’s about as close as I’m going to get!! One evening this past week Jeff was thumbing through our latest issue of Readers Digest. I love Reader’s Digest. Ever since I was a child I have loved Reader’s Digest. I know, I know… call me 60 years old. I can’t help it! I love the short stories, usually detailing someone’s heroic acts or miraculous feat of overcoming some sort of insurmountable adversity. I love the funny tidbits cataloged in the Off Base or All In A Day’s Work sections. I even tolerate the usually biased “informative” articles as well. I used to read Reader’s Digest while visiting my Grammie and Granddad in Wyoming over Christmas vacation. Then my parents subscribed for a while and I read the little periodical through my high school years. Now I read my very own subscription every month with glee. Combine all seasonings in a small bowl and rub evenly over roast. Place meat in 6-quart slow cooker. Add water. Place pork on large cutting board or platter and let rest for 10-15 minutes. Pull, slice or chop to serve. Serve in buns with BBQ sauce. When I first read the recipe, I told Jeff that we definitely didn’t need a 5lb pork roast. I would buy a 3lb roast. I got to the store and the SMALLEST size that they had was a 7 lb roast, bone in. So that’s what I bought. My biggest tip this week is as follows: I cooked my roast for about 5 hours on low and then 3-4 hours on high. Maybe my roast was extra big or the bone made a difference… I’m not sure. Alls I know is that we had dinner of pulled pork and it was fine, but then I let the roast cook overnight on low for probably another 12 hours. When I took the pork out the next morning, it melted like butter… like budha baby. It was so tender it fell off the bone in the crockpot. So I would suggest letting cook for as long as possible. Even 24 hours. That is my only tip this week. What can be easier than shaking some spices together and turning on the crock pot? 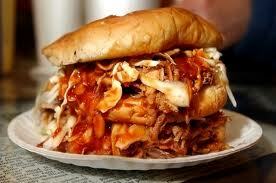 I personally am not a huge fan of pulled pork. In light of last weeks lament about tiring of chicken and ground beef, I decided it was time to splurge a bit and branch out; try something new. The other white meat was calling my name… pork. I’ll admit I don’t know a whole lot about pork. I grew up eating beef… beef in every shape and form imaginable… steaks, roasts, burgers, etc, etc, etc. My dad is a cattle rancher and growing up our freezer was packed full of our yearly butchered steer. Chicken was a rare treat at my house, let alone anything beyond that like pork. After I moved away to college, I think it was probably a good five years before I started eating beef again. Chicken became my normal go to. So my experience with pork has been fairly limited. FYI: this pic is a general depiction, not from the actual recipe! But it looks pretty! 1 jalapeno pepper, seeded and finely chopped. In a small bowl, combine tequila, lime juice, red onion, sesame oil and cumin. Blend well and reserve 2 tbs. 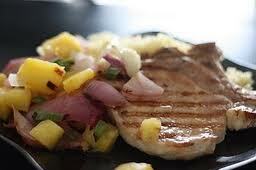 Place pork chops in a shallow dish, covering with marinade. Cover pork chops with plastic wrap and refrigerate 2 to 4 hours, turning occasionally. Drain pork chops and grill on a grill rack over high heat for 8-10 minutes or until juices run clear, turning once and brushing with jalapeno jelly during the last 5 minutes. Serve with Salsa. I had four pork chops instead of six and I think that was a perfect amount. I didn’t add the serrano pepper to my salsa because I think the jalapeno adds enough kick for us. You can make your own decision there. The only ingredient I didn’t have for this recipe was the jalapeno jelly! I was so bummed! It was on my list, but my store didn’t have any. Then I ment to stop by a different grocery store, but didn’t make it there before it was time to make the pork chops. Then I thought maybe my next door neighbor, Nikki, would have some, which I’m fairly certain that she would have, but I didn’t go ask. Sadness. I’m fairly certain the jalapeno jelly would have made the pork chops super delicious. I knew the salsa would be delicious and it was. The marinade was good too, but I think the jelly would have put it over the top! I didn’t have the jalapeno jelly! All the chopping for the salsa gets old. I need to get myself one of those Pampered Chef choppers! All in all, I think this recipe is worth another try WITH the jalapeno jelly. I’m fairly put out that I didn’t have any as I was pretty sure that would be the secret ingredient for this recipe! So I’m still working on getting rid of my St. Patty’s cabbages. I saw on Facebook one of my other friends had caught 29 cabbages… 29!! I’m having a hard time using up 5! I guess that’s when you start knocking on neighbors doors, farming out your cabbage catches to the masses. My friend Beka had mentioned that she would always make spring rolls with her St. Patrick’s Day cabbage. The light dawned in my head as I thought what better way to use up my cabbage than to have Beka and her family come over for dinner and have Beka bring her recipe along. As an added bonus, Rebecca gets to be a featured guest cook on my blog. Now really, who would turn that down??!! In a very large pan or wok, brown the meats. Drain off fat. Add in the garlic, ginger, liquid sauces and oils. Mix together well. Adjust flavorings as needed. Take meat mixture off burner. Stir in green onions, cabbage, and carrots. Mix well. Allow mixture to cool enough to be able to handle. Place approx 1 tbs of filling in wrapper. Roll per instructions on the package. Deep fry rolls in fryer until golden brown. ** Beka had brought along two packages of wrappers, a large size and a small size. We used the entire small package which contained 50 wraps and 10 of the large (that package contained 25). We both agreed that the larger wraps worked better, however you only get 25 per package so the smaller wraps are more economical. Did you know there is a proper way to cut a cabbage? I didn’t until I went to start chopping mine up and stood there at my cutting board, knife in hand, not sure what to do. I ended up looking it up online (what did we ever do before the internet??). The proper way to chop a cabbage is to cut the core off, slice in half from top to bottom and then quarter each half. Once quartered, you are to cut off the inner heart that is now exposed and then chop as desired. 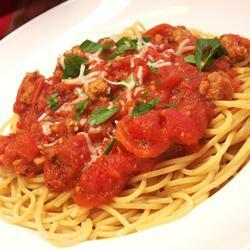 You can have long stringy pieces like for salads or chopped up like for this recipe. Who knew? Beka goes to the local Chinese grocery store to buy her wrappers. These wraps are way better than the ones I buy at the grocery store. They were called Spring Home – TYJ Spring Roll Pastry. They’re kind of a mix between an egg roll wrap and the rice paper spring roll wraps. You have to wet a cloth to keep them moist while you make your rolls. Remember last week when I said I didn’t have sesame oil so I just used olive oil? I learned this week that sesame oil really does make it better. Definitely the biggest high point for me this week was making the wraps with Beka! Making these alone would have taken a really long time… it was much more fun sharing the task with someone and talking while you work. They were de.lic.ious !! We had a total of 6 adults and two babies for dinner that night and out of 60 rolls, I think we only had about 18 left. So good, I salivate just thinking about them now. Between Beka and I, we had almost everything we needed for this recipe. Beka provided the deep fryer. Since I don’t have a deep fryer, to make these delicious little bits again, I’d have to purchase one or borrow. They do take a lot of time, but as noted above, this is made easier when you’re making them with someone else… like a party! All in all, I thought this recipe was great. Everybody raved at how good the spring rolls were. I would definitely love to make them again. A deep fryer may need to be on my wish list in the future! I would love to be a collector of cookbooks. What a beautiful combination… books (which I LOVE) and a collection of recipes filling their pages (which I NEED). I only have a few cookbooks and I keep telling Jeff I would love to have more. He usually gives me the following response: “I’m not buying more cookbooks, you don’t look at the ones you have!” What kind of objection is that??? A good one I guess… I don’t look at my cookbooks very often. I don’t know why, perhaps because it takes time to thumb through them to find something that looks interesting. But thanks to my new project, I’m determined to open them more often. Trim excess fat from pork chops. In a large electric skillet, slowly brown chops in oil- about 15-20 minutes. Drain of excess fat. In a small bowl, combine salt, chili powder and pepper and sprinkle over chops. Add rice, onion, green chile peppers and tomatoes. Stir to combine. Cover and cook over low heat, about 40 minutes, stirring occasionally. I thought green pepper sounded good with this so I added about half a green pepper – chopped. I don’t have an electric skillet. I just used a large, deep skillet pan on low to medium low heat on the stove. It seemed to work for me. Be sure you use a deep pan; once you add the tomatoes, rice, etc, a regular pan probably wouldn’t hold everything. Mix together the rice, tomatoes, onion, chiles and green pepper in a bowl before adding to the pork chop pan. It was much easier to pour it all in as a mixture, rather than trying to mix it once in the pan. I didn’t have to tweak the seasoning amounts at all. I usually assume most recipes need more seasoning, but this one didn’t. All of the ingredients for this dish I usually always have on hand… it would be easy to pull this together in a pinch. Prep time is really fast. My biggest complaint is that 40 minutes to let the rice cook is NOT enough time. After 40 minutes the rice was still crunchy. I added another 10 minutes to the timer… still crunchy. I add another 10 minutes to the timer. Almost done but not quite. At this point, it’s been cooking for 1 hour PLUS the time to brown the chops PLUS prep time. We were really hungry at this point so we ate slightly crunchy rice. Now, I accidentally added 1 cup of rice instead of 3/4 cup as called for, but I don’t think that would make that much difference. I’m not sure if turning up the heat would help or not, but be aware that this dish will take a while to cook. If I had an electric skillet, maybe this wouldn’t be a low point, but I could only fit 4 chops in my pan. Granted, my package of chops only came with four, but had I had six, they would have not all fit. However, you really need to use 6. Four chops leaves you with more rice than meat, which is not a great thing in our house. All in all, I think this recipe gets a 2.5 star rating. they tasted GREAT, but the rice debacle really did it in for me. What do you think? Going to give this one a try? I’d love to hear your comments or improvement suggestions for this recipe!